My Green Smoothie Recipe for Clear Skin! Ever since I got engaged, can you guess the one beauty thing I’ve been stressing out over? My SKIN! It’s not that I have terrible skin, per say, but doesn’t every girl want perfect, pore-less skin walking down the aisle? Every wedding magazine and website I’ve read said it’s best to start a good skincare regimen more than six months before your wedding day. I already take pretty good care of my skin: I cleanse, moisturize and use a retinol every night – but it still has a lot of flaws! 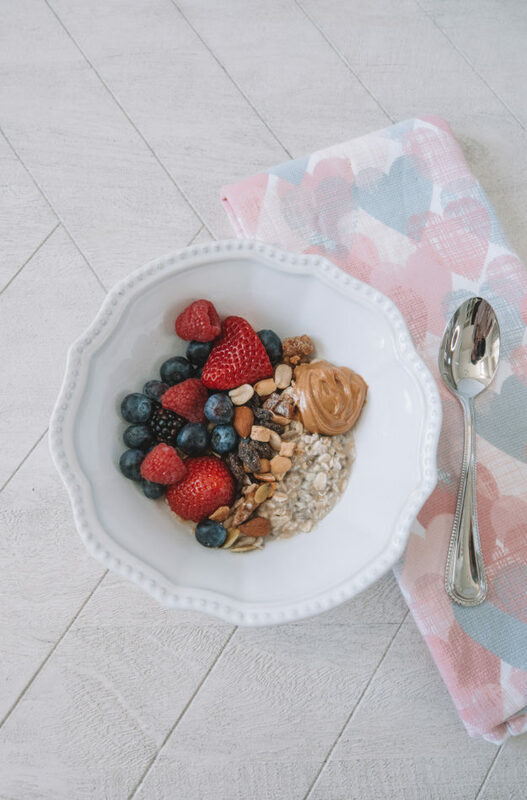 So I started doing a TON of research and found that what you eat can actually have a huge impact on your skin, maybe even more than what you put on it. 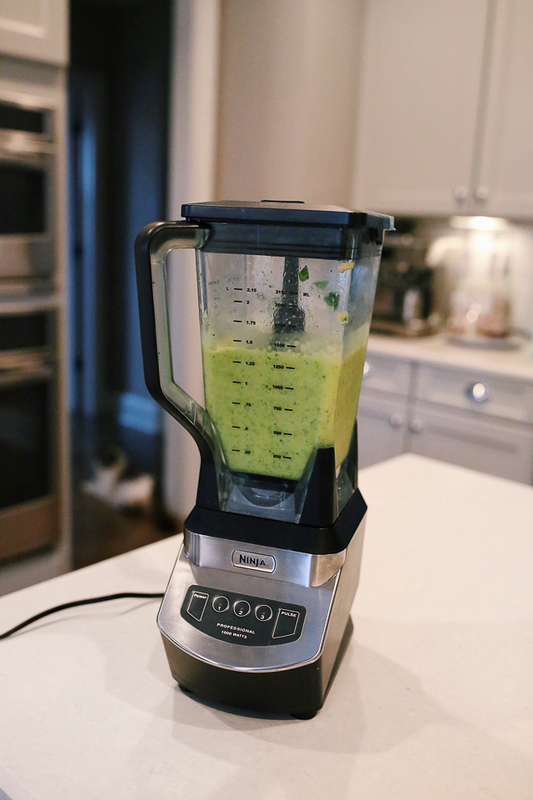 After researching a ton of different “superfoods” that are good for your skin, I realized that most ingredients would actually taste pretty delicious in a smoothie… so that’s when I started experimenting in the kitchen! 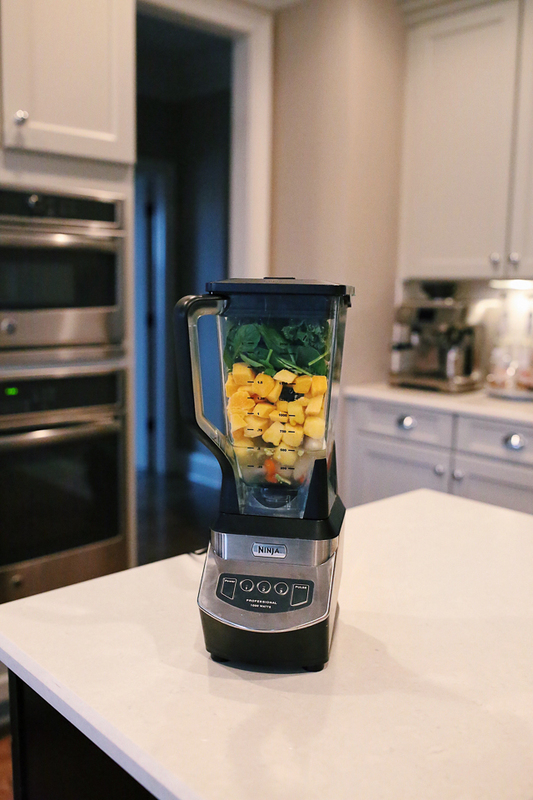 I made six or seven different versions of this smoothie until I found the perfect combination that both tastes good and is packed with skin-boosting nutrients. And y’all, this one is a WINNER! I’ve been having this smoothie every single weekday for the past couple of weeks and even Chris likes it. 🙂 Read on for the recipe! Also, I apologize in advance for the photos – it was pouring rain yesterday so the lighting wasn’t the best in my kitchen! 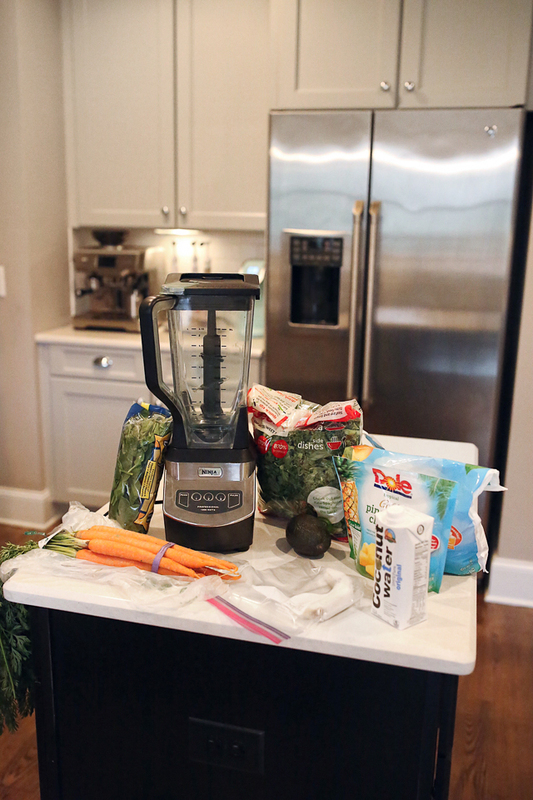 This smoothie is PACKED with skin-boosting nutrients. Every single ingredient does something good for your skin! Carrot and mango: Carrots and mango are both packed with a family of pigments called carotenoids (which give them their vibrant orange and yellow color). The body converts these plant pigments into vitamin A, also known as retinol (yep – the exact same “miracle product” you apply to your skin!). My dermatologist told me that these carotenoids can help give a rosy glow to dull looking skin – eating as little as one carrot a day can help improve skin color and may reduce wrinkles and other signs of aging! 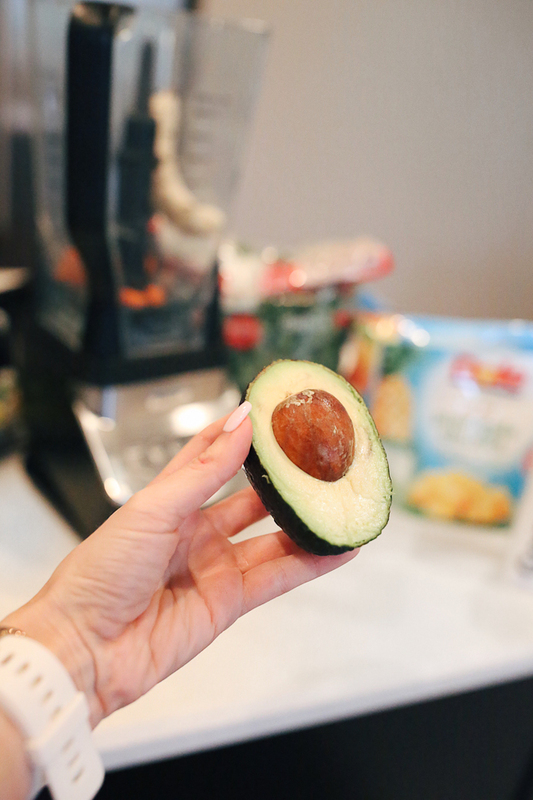 Avocado: To max out the nutritional value of your carotenoid intake, blending carotenoid-packed carrots and mango with healthy fats (like avocado) is key. Your body needs fats to convert these vitamin A precursors into the real deal. Pineapple: Pineapple contains vitamin C and amino acids which are essential for clear skin – pineapple also helps increase collagen synthesis to keep your skin flexible and firm. Spinach and Kale: Dark, leafy greens are so good for your brain, body and SKIN! Spinach is a wonderful source of iron, folate, chlorophyll, Vitamin E, magnesium, Vitamin A, fiber, plant protein and Vitamin C, while kale contains contains copper, a mineral that boosts the synthesis of melanin. Melanin helps to protect your skin from the sun and even offers anti-inflammatory benefits for your skin. Coconut water: We’ve all heard it before: staying hydrated can also keep your skin healthy too, and coconut water is a great hydrating alternative to water! One cup of coconut water contains 24 milligrams of vitamin C. You need vitamin C in order for your body to make collagen, a structural protein that gives your skin firmness and elasticity. And without further ado… the recipe! This recipe makes 2 servings, but you can easily cut it in half if you’re the only one drinking it. 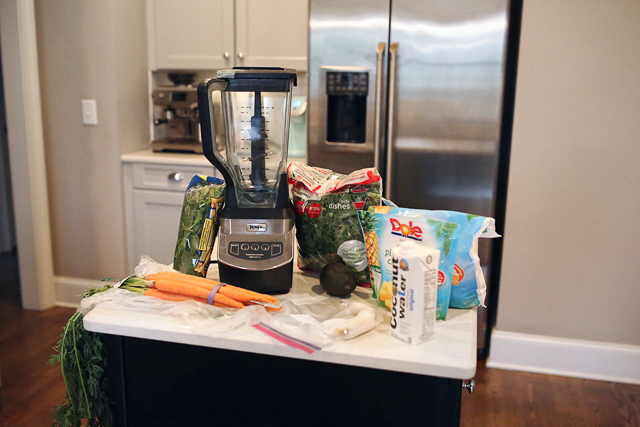 I usually make this smoothie after a workout or in the afternoon as a snack. I find that smoothies aren’t very filling for lunch (I am always ravenous an hour later), so I wouldn’t recommend it as a meal replacement unless you pair it with some protein! Definitely going to try this!! I’ve been taking good care of my skin but feel like it needs a little more help elsewhere so this may be a perfect solution. Thanks for sharing!! Thanks for the recipe Cait! 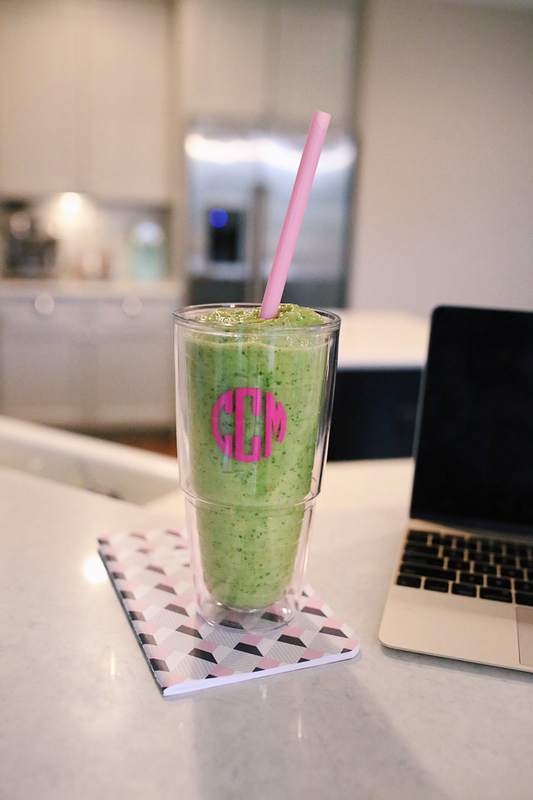 I love a green smoothie, especially as the temperature starts to warm up! I hope you're having a lovely Tuesday! I like green smoothies! I need to try this one! 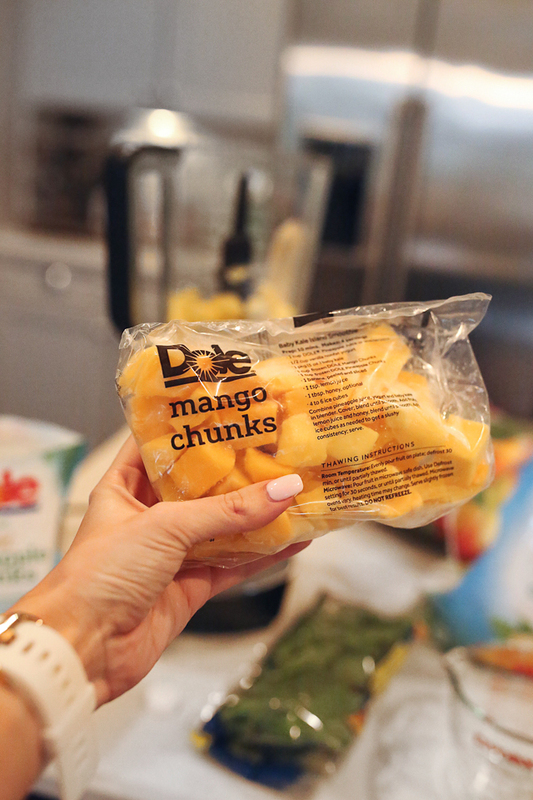 Love trying new smoothie recipes! Hi! Love reading your blog! 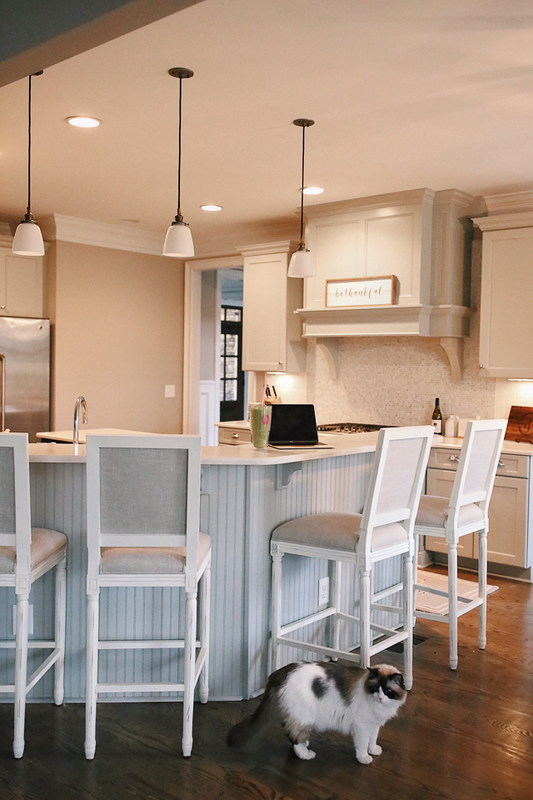 Random question: where did you get your kitchen bar stools? Thank you for this! I definitely want to try! Ooh this sounds so yummy, I can't wait to try it myself. I love smoothies in the morning! This sounds like the perfect smoothie… except I think I am the only person on earth who does not like coconut water. Do you think swapping for just regular water will affect the taste? I love green smoothies! This is a recipe I am so going to play around with!! This is exactly what I do for my morning smoothie but I add 1/4 cup of gluten free oats and it keeps me full way past my normal lunch time. I made this but added my favorite vegan dairy free protein powder! 24 grams of protein boost was exactly what it needed and so smooth and creamy! Love it! Looks so yummy! I love smoothies in the morning and they really are great for the skin! We are getting married in July so I will be trying this! Thank you for sharing…I had no idea what you eat could have that much of an impact (aside from drinking water). This smoothie sounds amazing! I'm not a huge fan of avocados but I definitely need to try this now. How do you like your ninja? I love it!! Mine is four or five years old now and still going strong. I love that it's able to blend virtually anything even oatmeal! I have been getting back into drinking smoothies again. And one of my goals this year is to have better skin. I will have to try this smoothie recipe out for sure. I used to have the same ravenous problem until i started replacing coconut water with coconut milk (those $2 cans of low fat organic coconut milk from Trader Joe’s) and adding chia seeds (reconstitute 2 tbp In water for 5min). Voila… Meal replaced! 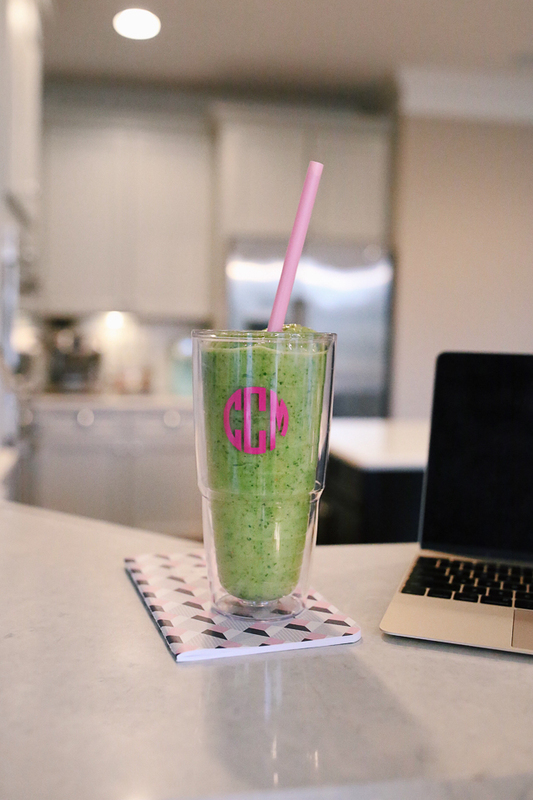 I drank this smoothie every day for two weeks, and there was a noticeable difference in my skin not just on my face, but everywhere! Even my husband asked if I had been tanning haha! Looks so good can’t wait to try !